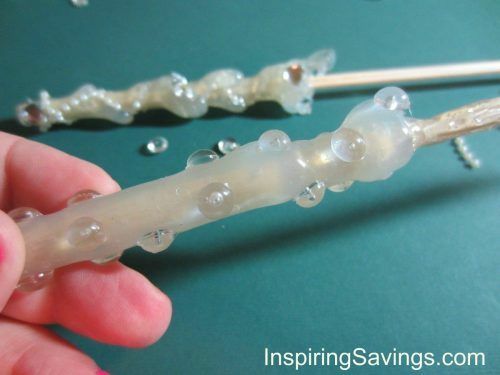 Make homemade Wizard Wands out of chops sticks and hot glue. This craft is not only perfect for your Halloween Costume, but for dress up too. All month long my kids have been on a magical journey. It all began by allowing them to watch their very first Harry Potter Movie, the Sorcerer’s Stone. And course I have to make them a Realistic Homemade Wizard wands of their own. It will be a long time before I will allow them to watch the other movies, much too scary for their little eyes. But in the meantime, I love just watching them use their imaginations. They have been walking around with my wooden cooking spoons as wands. Much too funny to watch. I really wanted to make something special for them. I sat down in my “craft” room and did some brainstorming. I came up with up-cycling chopsticks with hot glue. They came out so cute. 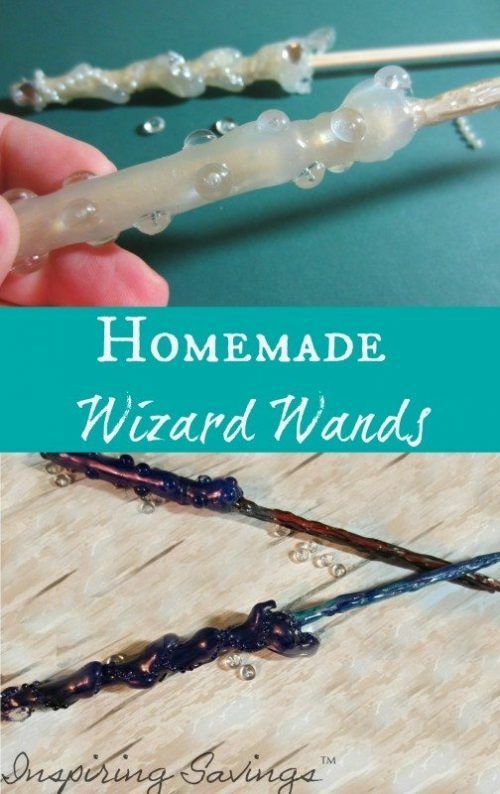 And your Homemade Wizard Wands will too. This is where your creativity will come into play. Make them your own and based on your child’s personality. You are going to want to be very careful after all you are using hot glue. First, start with the base of your wand. 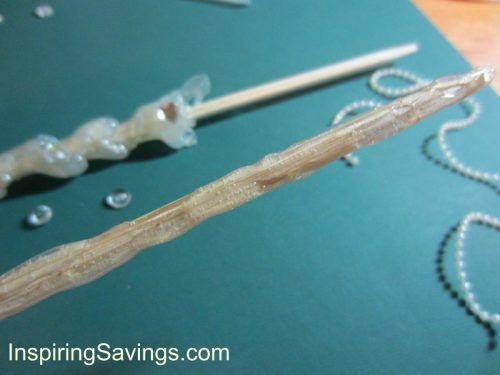 After your clue gun is completely heated and ready to go, make strips or lines of hot glue on your chopstick. When you have completely made it around the base once. Twirl. This is the best part. The hot clue will do its own thing with your guidance. Once the glue is to the point of stabilization (or no movement) repeat the steps above again. This will make the handle. Twirl, Twirl, Twirl. 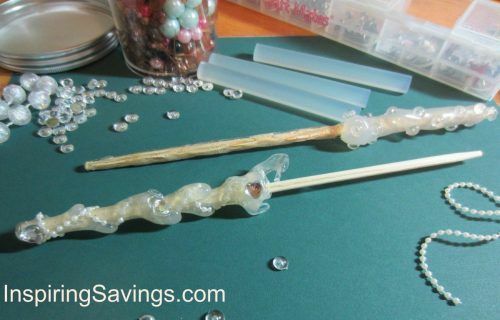 This time add any embellishments to bling your wand out. Let completely set (roughly 5 to 7 minutes). 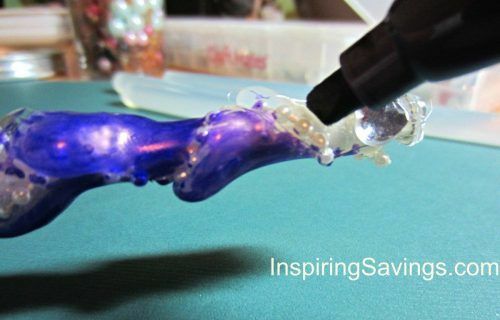 For the tip of the wand, using the hot glue gun, slowly add in your lines with a light squeeze. Making sure you are not adding copious amounts of glue. You will not need to twirl since this will be a very small amount of glue. The picture below is an image of both wands; one is completely done and one is just about ready for the next step. Bringing your wand to life is as simple as using sharpie markers. I am sure there is a better way to add color to your wands, but this is what I had on hand and quite honestly the only thing I could think of. If you have a better idea for coloring your wands drop us a comment. Color away! With the sharpie marker, it took me about 5 minutes to complete. I wasn’t being to particular. I also colored over the embellishments. You end product will look similar to the very first image. This whole process for 2 wands took roughly 30 minutes to complete. The fun and creativity are endless. Have fun! Well this looks like tons of fun! Just pinned! Thanks Maura!!! My kids have been going NUTS with their wands. I’m gonna have to make one for Isabel. She just finished the first book and watch the first movie for the first time and all she thinks about now is Harry Potter! That would be fun!!! We could join you guys. We could have a wizarding wand fun. We love Harry Potter too. Noah’s room is nothing but Harry Potter.